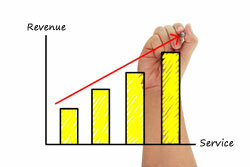 A look at the cause-and-effect of customer satisfaction and increased revenue. A study conducted by the University of Michigan Ross School of Business has determined that companies ranking in the top 20% of the American Customer Satisfaction Index (ASCI) greatly outperformed the stock market, resulting in a 40% return. The ACSI model is a cause-and-effect model with indices for drivers of satisfaction on the left side (customer expectations, perceived quality, and perceived value), satisfaction (ACSI) in the center, and outcomes of satisfaction on the right side (customer complaints and customer loyalty, including customer retention and price tolerance). The index is then delivered in a matrix based upon a 100 point scale for 44 industries across the nation, including hospitality, F&B, and retail. The inception of this index began in 1994 to prove/disprove the theory that guest service is relational to a firm’s financial performance. Over the fifteen years of the index’s life, the ACSI has predicted corporate revenue & earnings growth, stock market performance, aggregate corporate earnings growth, and average Market Value Added, which measures a firm’s success in creating wealth for shareholders. Quality of customer service delivery is no longer an elusive conversation between Operations, Finance, and Human Resources executives. There is now a solid determinant to a hospitality organization’s long-term financial success, it is called guest service satisfaction. The guest service value carries so much weight in a firm’s financial performance that it supersedes price promotions. Although pricing can be an effective short-term growth opportunity, it has been proven through ACSI’s research that price cutting is almost never sustainable in driving revenue growth. Testing for quality of customer service is an ongoing process as new amenities become available in the marketplace, consumer’s satisfaction levels will fluctuate. To best manage the changing tides of consumer sentiments resulting in a firm’s favorable or unfavorable guest service satisfaction, mystery shopping companies are best positioned to provide hospitality organizations with real time guest service analytics. Reports can include statistical values comparing divisional performance, drilling down to manager performance, and linking back-of-house departments to the overall guest service satisfaction level. Guest service satisfaction sovereignty is the business model that will help hospitality organizations survive the current economic times. Focus your company’s revenue model by recasting P&L into customer specific categories, thereby elevating the value of customer-centric experiences. Then begin to monitor customer service standards property-wide to ascertain your base line guest service performance. Work with a mystery shopping firm that specializes in your industry to define desired behaviors, grading of evaluation questions, benchmarks to Mobile standards, provides training & sales recommendations, and lastly, compiles statistical data of the customer service experience offered in your facility. By repositioning your focus on revenue generation toward guest service satisfaction levels, the stellar stock market performance results as measured by the American Customer Satisfaction Index (ASCI), can be the competitive advantage that pays off in dividends for your hospitality organization. Christine Newcombe is owner of Studio En-novate, a total experience marketing company specializing in innovative guest service, marketing and entertainment strategies to create a unique and distinguishable competitive advantage for her hospitality clients. She is a recognized expert in developing new revenue sources for the hospitality industry and creating high-yield marketing strategies for her clients. Trip Advisor Customer Feedback – Get Wise Not Mad!